The black Canare Starquad XLRM-TRSM Cable (1') is handcrafted with the super flexible Canare L-4E6S cable and superior Neutrik XLR and TRS Phone connectors as well as reduced hum, EMI and no handling noise. 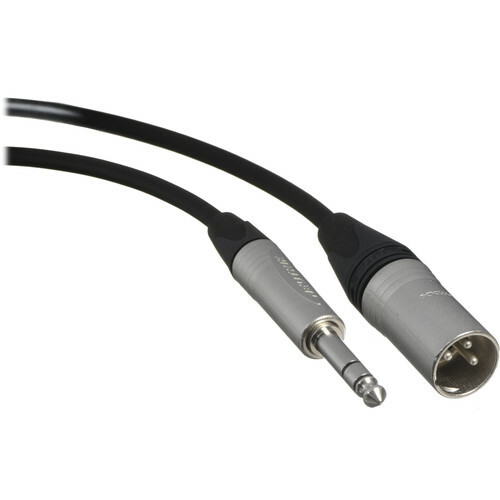 This cable is perfect for all microphone use and great for connecting balanced output of some audio processors, mixers, and low density patch bays to XLR inputs. Box Dimensions (LxWxH) 10.0 x 5.8 x 0.9"
Starquad XLRM-TRSM Cable (Black, 1') is rated 5.0 out of 5 by 1. Rated 5 out of 5 by Gabe from Great quality yet still cheap You wouldn't use anything else other than Canare Starquad and Neutrik connectors for your cables, but why spend a lot of time making them yourself when you can buy them for so cheap? I have bought several of these premade cables, and I have opened the connectors and inspected each, and they all look great. The only thing I would do differently is shrink the ground and boot the solder joints with shrink, but that's because I'm fussy. I do not have any doubts that these cables will hold up for years.